172RG Fix | Tennessee Aircraft Services, Inc. The 172RG was designed, and mostly used, for step up flight training into complex aircraft. That means the majority of the maintenance expertise and experience has been localized to the few flight schools that operated the type. While the RG shares a lot of structural commonality with the fixed gear plane, there are a few significant differences. Recently we had the opportunity to see the retractable gear version of the 172 in our shop. On these rare occasions, the repair is often unique. This event proved to be no different. The 172RG is a mix of interesting design decisions. Back in the day, the industry was in need of an inexpensive retractable gear trainer. Cessna’s answer was to swing the gear on the ubiquitous 172.At first glance, this makes perfect sense. The logical training progression is the 152 for basic training, the 172 for instrument and 172RG for commercial .Each transition is comfortable with a low intimidation factor for the student. The interesting part is that a complex high performance trainer needs several elements: retractable gear, controllable pitch propeller and over 200 horsepower. The 172RG only got saddled with 180 carbureted horses, so an extra training in yet another model plane with 200+ horsepower is required. I suppose the fact the engine manufacturers at the time didn’t make an engine to fit the mission was mostly to blame. The closest option was the Lycoming IO360which barely put out 200 hp on a good day. It also weighed quite a bit more than the O360, in part due to the angle valved cylinders used on the IO360. For the needed performance of the airframe, the 180 horsepower was sufficient; it just didn’t raise the plane into high performance category. 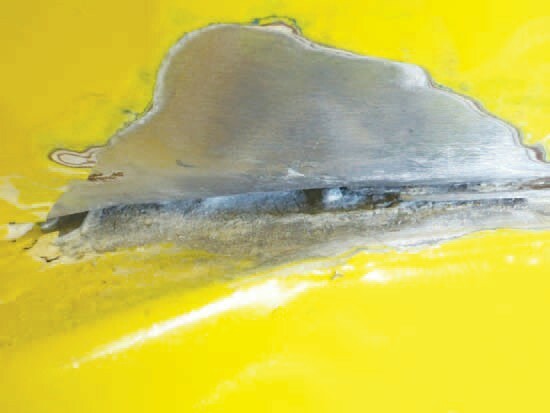 During a routine inspection of a 172RG, the A&PAI of a small fleet operator noticed a little deformation on the top of the channel that bridges the center of the aft wheel well. 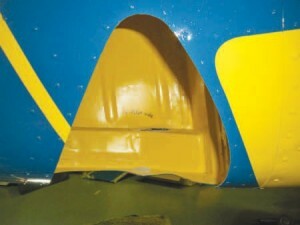 This is the structural tunnel added to the 172RG series when so much skin was “hogged out” of the fixed gear 172 to create the wheel wells for retractable main landing gear.It’s in the center aft of the belly and is the primary structure that keeps the tail from buckling to the ground under its own weight. This find is of particular importance because there isn’t any method to inspect the interior of the tunnel. The corrosion spot started where the aluminum wheel well divider panel is riveted to the top of the tunnel. This attachment partially obscured the damage, allowing the corrosion to continue until it completely breached the top of the tunnel. The opening gave all the water slinging off the retracted wheels to find its way into the interior of the tunnel. With no way out, the water was able to run amuck inside the tunnel, promoting the corrosion. Keep in mind, none of these planes have any factory applied corrosion protection. Aftermarket applications aren’t effective in this area either since there’s no obvious way to get it in there. This is on the right side of the airplane looking into the right main gear wheel well. The tunnel is in the lower structure connecting the front of the open wheel well to the back. If the gear leg bumper pads are deteriorated, the main gear retracts just a little higher and the tires will eventually touch and damage the plastic. This allows water slinging off the tires into an even larger unprotected area. Repair starts with removal of the plastic wheel well liner and a detailed inspection of the newly exposed structure. The damage to the tunnel is large and extensive, so complete replacement is determined to be the preferred repair. An initial check of Cessna’s inventory surprisingly shows the part in stock. All seems good until the actual order generates a response from the parts department that the part is nonexistent. In some cases a new part is the only realistic solution. Cessna is willing to build the needed piece, but set up cost and time put availability at 120 days and price somewhere north of $5K. The search is on for a serviceable replacement. Unfortunately, this isn’t one of those easy bolt on components. Removal from a donor plane requires careful drilling of all the rivets, making sure the rivet hole damage is kept to a minimum. There’s no assurance the hole placement in the donor part will fit the holes of the repair airframe, so every precaution is taken to keep material loss to the minimum. 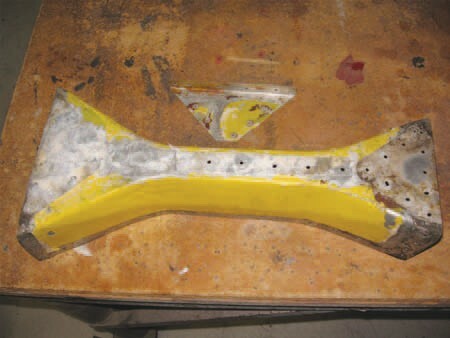 Before the old part is removed, the airplane must be fully supported in such a way that it will still be in the exact position when the new part is installed.There is enough structure remaining in the top of the tail to prevent twisting, so our primary concern is bending. A tail support is firmly attached at the tail tie down and wing jacks are mounted under the wings. Jacks under the wings are used instead of just allowing the plane to rest on the tires due to their instability.You can imagine having everything all lined up at the end of the day and coming in the next morning to find a flat tire and a wrinkle in the bent tail cone. Just a bad way to start the day. A top view of the damaged tunnel after removal. It’s about 20″ long. We got our salvaged tunnel from Air Salvage of Dallas, who did a good job of removal from the carcass they had in the yard. The damaged part is removed, and we discover that several mounting angles and small support parts have corrosion damage as well. Fortunately, they are mostly simple pieces to fabricate from standard Alclad stock. Some of these are connector parts from the airframe bulkheads to the channel. Fabricating replacements gives us the ability to custom drill the rivet holes for a like new fit. Once the replacement part arrives, all parts get a trial fit. The connector angles are drilled for best fit and amazingly, all the other tunnel rivet holes fit well enough that none of the holes need to be drilled oversize. Everything is removed and gets a very detailed cleaning and etching in preparation for epoxy priming. This includes all the wheel well area exposed after the removal of the damaged part and the plastic wheel well covers. Since most of this area won’t see the light of day for another couple of decades, now is the time to help mitigate future corrosion issues. This is a close up of the corrosion damage after some cleaning to reveal how deep the problem is. Riveting goes smoothly with some effort to be sure the new rivets properly fill the slightly swollen original holes.There area series of holes that require use of blind rivets. We’ll often go to great lengths to avoid use of blind rivets, but there are times that the structural design just won’t allow anything else. With all the riveting completed, the wheel wellplastic lining and center divider panel can be reinstalled.The edges of the plastic are sealed to help keep exhaust fumes out of the cabin area just above the wheel wells. That sealant also helps keep water and debris out of the gap between the lining and the structure behind it. Since we epoxy primed all that hidden structure, it shouldn’t cause any corrosion issue for many years to come. The damage necessitating a repair was our familiar old adversary, corrosion. However,the repair itself did present some challenges that are becoming more prevalent in the legacy series Cessnas. This repair required basic support and jigging of the fuselage to maintain everything in alignment. A new tunnel assembly was nowhere to be found so an extensive effort was made to locate a serviceable replacement. Finally, supporting parts had to be fabricated to allow for mismatches in the fit of the replacement part. Every repair scheme has its nuances. It’s likely we’ll continue to see more repairs on the legacy fleet that require this same concert of efforts.